Description of "Coastal India (eBook)"
Sitting in the office cubicle and getting bored or feeling tired to complete the deadlines! Just take a break; it will give you a new energy towards everything in life. Planning for a vacation? This book will guide you to find the appropriate location only for you. What is more exciting than spending a long weekend relaxing under the palm trees in sun kissed beaches with clean white sands spread for miles or enjoying the scuba diving in deep blue sea or spending time with your loved one in a lonely island. This book is for them who love to travel usually in coastal areas. In this book I have mentioned nearly 100 beaches of India. I have tried to cover all major and almost all minor beaches of India. I hope this book will help the readers to decide their destination depending upon their location, connectivity, availability of accommodations and attractions. Few snapshots are also given to know your destinations better. Sayantan Das currently lives in Kolkata and works in one of the best multinational Information Technology Company of the World. He has done his B.Tech degree on Electronics & Communication from West Bengal University of Technology.An Engineer by education & profession; writing is his passion. His father and mother both are government servant. He has traveled almost entire India and this book is written from his personal experience. He loves to travel, reading & singing. 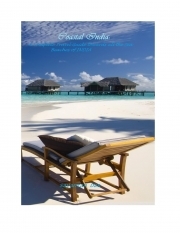 Reviews of "Coastal India (eBook)"
Detailed description of the beaches. Very handy tips are given for many places. It will help Indian as well as foreign travelers to know their destinations, during vacation planning. Just love the way it describes the places(short notes, How to Reach, Attractions, Accommodations, Photos etc).